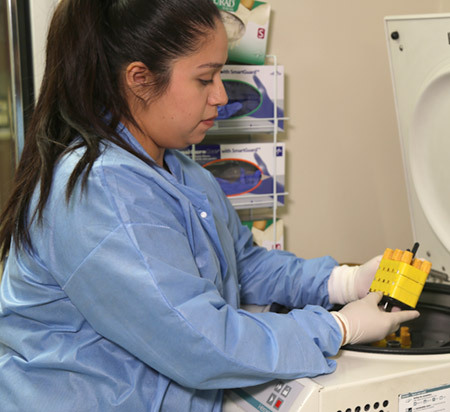 When your provider orders lab work, you want to know that you are in expert hands to deliver the reliable results needed for an appropriate diagnosis. You can be assured of our commitment to both excellence in quality and patient experience. Our full-service clinical laboratory has passed rigorous testing mandates and is accredited by the College of American Pathologists. Additionally, our team takes pride in clinical procedures such as drawing blood and ensuring your comfort - difficult to stick patients have become our specialty and patients frequently comment on the skill level and compassion of our phlebotomists and medical laboratory technologists. For outpatient laboratory procedures, we offer two convenient locations. One is found in the centralized laboratory site near Admitting in the main hospital on the first floor. We also recommend this site as your choice for specimen drop off from home health agencies and also for pre-employment drug screenings. You can also visit Imaging Plus for outpatient laboratory procedures. With My Chart, you can easily access results and reports such as lab work and easily share those results with your provider or with family members who may assist in your care. For more information about the Laboratory Services at Titus Regional, please contact us at 903.577.6370 or via fax at 903.577.6372.